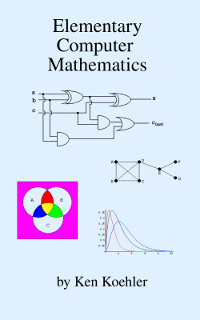 Since writing the online textbook "Elementary Computer Mathematics" in 2002, I have made it available for free on the Internet. In the past four+ years I have hosted it on my personal desktop computer, the same computer I use for my research. Over those four years, students from all over the world have accessed the text a total of over 1.4 million times. The interest which you all collectively have shown in my work has been very gratifying, and I thank you. Unfortunately, my research work currently in progress will make my computer far less reliable than the occasional power outages have to date. I am sorry about the price of the paperback version; Amazon prints their paperbacks on demand, and their printing costs are higher than I would have liked. The paperback version is $29.95, while the Kindle version is $7.95. However, if you purchase the paperback, the Kindle version is free. If you do not own a Kindle, Amazon provides free Kindle Reader apps for Windows, Mac, Android and iOS. In addition, they also provide a Kindle Cloud Reader which only requires a web browser. I know it is unpleasant to find that something that was once free now costs money. I have tried to price it so that purchasing a copy is not too onerous. I hope that you will consider buying a copy in either format, and that you will find it as useful as all those who have studied it before you.